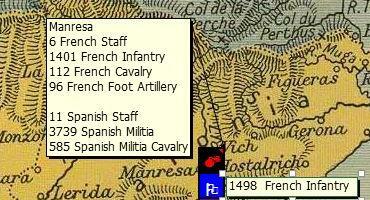 General Schwartz, from Duhesme’s Corps in Barcelona, has been ordered to move north to Manresa His force consists of three battalions of Italian and Neapolitan light infantry, one battalion of Swiss infantry, a squadron of cuirassiers and four guns. Having received a bloody nose from the local militia when leaving Molino del Rey on 4th June, he arrived at Manresa on 6th June to find nearly 5000 Spanish militia barring his entry to the city. His force needed supplies, as the action at Molino was caused by his men plundering the houses to get food. With a third of his force strung out on the road behind him, he decided to wait until the next day to attack. The local Spanish commander, Coronel Sant’Iglesia, did not feel that his militia were up to attacking the French, so he too waited in a defensive mode. Most of the militia were stood down overnight while a few hundred men manned the southern walls of the city. Manresa is a city straggling along the River Llobrigat. There are steep hills to the northwest and a few low hills and woods scattered to the southwest. There are some old fortified walls at the south end of the city. On the morning of 7th June, with his forces assembled, General Schwartz sent his cuirassier squadron forward to protect the left flank as the infantry advanced. He placed his guns on a low hill to the left of the road with a good view of the city walls. The Italian Velites, who had suffered losses a few days earlier, had crossed the river downstream and advanced along the eastern bank of the river. The sight of the cuirassiers was too much for the 600 militia cavalry who were assembled at a mill at the extreme northwest of Manresa and they charged, scattering the cuirassiers who were outnumbered four to one. Buoyed with their success the militia swarmed up the hill and captured the French guns. General Schwartz narrowly escaped with his life for the second time in three days, and was badly shaken. The French managed to spike two of the pieces, but the Spanish took the other two and turned them to face the French. It would have been better had they towed them away because they were unaware of the presence of a battalion of Neapolitan light infantry in the woods immediately to their southwest, who counterattacked and took the guns back, albeit useless now as the militia did manage to wreck the remaining two cannon before retreating. At this point the Swiss and the other Neapolitan battalion opened fire and the Spanish cavalry ceased to be a viable fighting force. It was now an infantry only battle. The Velites had moved up the right flank to within musket range of the town and opened fire across the river, doing slight damage to the militia battalions in the buildings to the southeast. The Neapolitan light infantry kept up a fire against the militia lining the walls to the southwest while the Swiss stormed the bastion to the southeast and took the walls. The militia unit defending that sector withdrew and kept withdrawing until they were out of town and in the hills. But they were swiftly replaced and the Swiss were forced back out of the city again. With more militia battalions arriving to bolster the defences and some of his troops running short of ammunition, General Schwartz gave the order to withdraw. He would now have to move back to Molino del Rey, short on supplies and with little hope of finding sufficient food there for the retreat to Barcelona. Casualties: French 241 men and four guns. Spanish 291 men. Previous Previous post: September 1939 – the models in detail.